As some of you know, I have spent literally years working on B-17F Luscious Lady, as recorded in another build blog. In the intervening eons I have lost the pleasure of one of my main reasons for modeling, which is adding to my collection. I don't know how I actually got into diecast models, but years ago when I was at the Boeing Museum in Seattle I saw my second favorite airplane in 1/48 scale in a diecast kit, the Brewster Buffalo, and was amazed how good it was. I should have gotten it but didn't. While lurking around eBay a couple of years ago I saw the kit for sale at a fairly decent price, bought it (and other Buffs!!) and was surprised to see many other good subjects done by a few manufacturers, mostly in China and Japan. I took the plunge to add to my display case, and have been happy to do that while working on my own mad obsession. In addition to discussing diecast acquisitions, I will also discuss and show off some OPM (Other People's Models) that I've acquired over the years and fixed up one way or the other. I thought I would share some of these with you since, for virtually every one I have "put my mark on it." You know, like a dog in a fire hydrant factory. 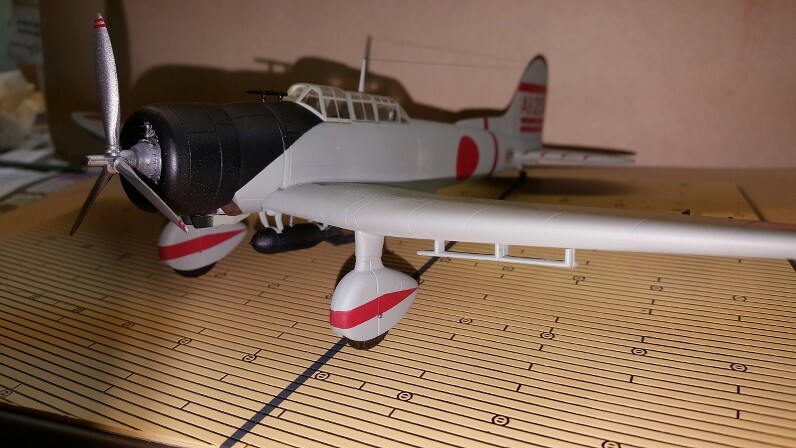 Anyway, a Japanese D3A1 Val is the first one I'm going to post about and discuss here. In the 1980s I did a Fujimi Pearl Harbor Val back when they were pearl gray and all that. Inevitably it got broken and I've always missed the fact that I no longer had a "Pearl Harbor Trio." Then I ran across this "semi-finished kit" on eBay from a Japanese company called Marushin. 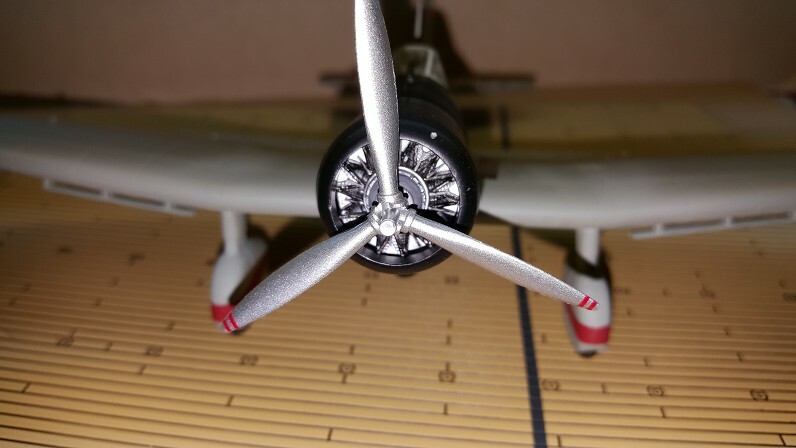 The model is "semi-finished" in the sense that you have to literally screw the wings on from the bottom and use metal pegs to fit things like the wheel spats and horizontal stabilizers on. There are also a number of plastic parts that you have to cut off and add to the kit. So it's not one of these that you pull out of the box and put on the shelf. One thing negative about Marushin kits is that their cockpit interiors are black and devoid of much detail. Since I was going to make this with the canopy closed as per the box top photo it didn't bother me too much but I did add an instrument panel, joystick, and Fine Molds Lewis gun aft, which of course you can't see. But here is how the kit looks after I finished with it. If you compare this to the box top model photo you can see that I added the manufacturer's data plate decal in front of the tail, and antenna wire. I also changed out the pitot tube, and added some detail underneath, although that remains somewhat sparse. Available research suggests that this aircraft had red striped decorations on the wheel spats, as pictured below. Of course it is from Akagi, and here is some information about the aircraft during the Pearl Harbor raid. AI-201 was flown by a hikotaicho. The crew were PO1c Kiyoto Furuta (pilot) and Lt. Takehiko Chihaya (gunner/radioman). Southeast loch and one Kanbaku attacked USS Maryland at Battleship Row. I like the profiles on the site containing this image, see http://japanese-aviation.forumotion.com/t29-33-pearl-harbor-raid-akagi-s-dive-bombers/. The Brazilian guy who did the profiles is to be commended for the ton of work he did researching them, though he has been criticized by the purists for some "errors." [The discussion about brown-tailed Kates off of Kaga is particularly "harsh," shall we say]. But I think the guy deserves a medal for all the valuable info he's published, free for everybody. While there are indications that some Akagi Vals did not have the decorations on the wheel spats, I felt pretty sure that this aircraft did, and not just because of the artwork. Anyway, if you look at the kit box top you'll see a problem. The red decorations on the wheel spats on the model are missing. At first I thought that I could simply fix this by taking decals off of other Pearl Harbor Val kits and aftermarket sets, only to discover for the first time that the geometric shapes of the wheel spat decorations for each carrier are different! And, I didn't have one for Akagi. So I wound up masking and painting the wheel spats for this model. Finally, if you look at the box top photo you will see that the engine in the kit is entirely flat black. That wouldn't do. So I hammer-tapped the engine out of the cowling (not that hard really) and painted it up so that it would look closer to the real thing. 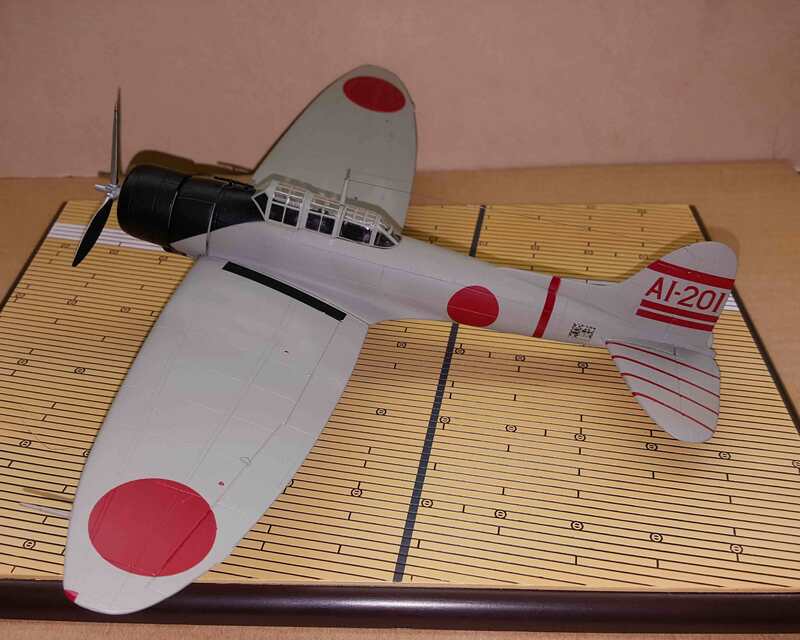 One of these days I'll get around to building the Hasegawa D3A1, but for the present I'm happy with this result. 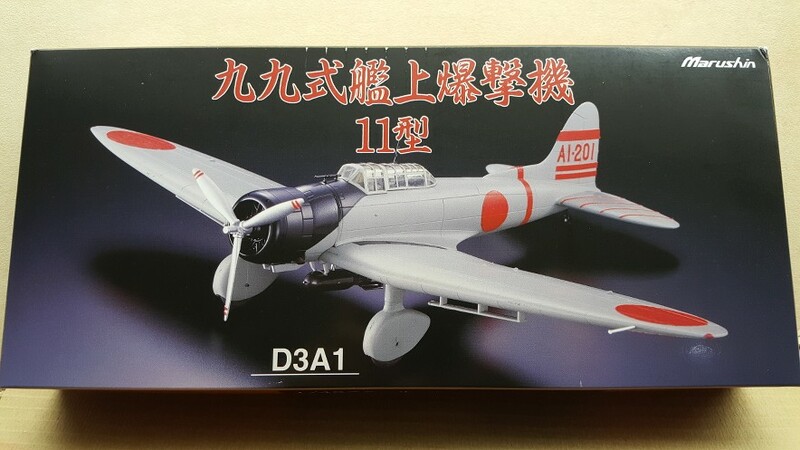 One other thing I'll say about Maruschin is that they are the only game in town if you want a D3A2 in 1/48 scale. That is a rare bird indeed! Have the model but haven't finished fixing it up yet. Also, kits from Marshuin weigh a ton! This is something refreshing, indeed! As a modeler, I hate pre-painted models (it takes away all the joy and also all the chances to screw it up ). I bought recently a die cast trailer from Testors to use it as display base for my auto builds but I was completely displeased with the way the thing is painted. The paint is good and tough as nails, but it's sprayed in gross neglect and I need to re-spray it and customize it before assembly. From a collector's perspective, naturally, the plastic is no match for metal so it makes complete sense. I found out from your other blog that you're a collector too and Yes, I'm backing you on your choice! Thanks for sharing this aspect to our hobby. I'm more of a builder then a collector of aircraft replicas, yet the reverse is true of my passion for classic and race cars. You most likely already know this, but Nascar, & Indy Car didn't renew their contracts when they expired with the model companies, preferring to sign with metal die cast companies that produce 1/18 & 1/43 scale versions per race that sell extremely well at each track, and they make a small fortune on each model sold, rather then next to nothing per plastic model. There's a whole new sub hobby of stripping these die casts, detailing them to whatever level you want to, then repainting and decaling correctly per race. I've yet to get into this phase of the hobby, as these die casts are rather expensive. Have you ever completely stripped on of your die-casts and repainted/decaled it as you would a full plastic build? I would love to see your Buffalos, as it's always been sort of a favorite aircraft right behind the F4F Wildcat. Have you ever completely stripped on[e] of your die-casts and repainted/decaled it as you would a full plastic build? Not yet, but I bought a trashed-up B-339C online and have plans to do exactly what you suggest. I have taken the cowling off and will completely re-do the engine. I have some Belgian decals and will make it one of the Buffs seen flying from Newark Airport with US Civilian Registration numbers over the military camouflage and Belgian national insignia. Since I live about a 30 minute drive from present-day Newark Airport it's a link with the past too, just like Republic out on Long Island is for you. I was not aware of the NASCAR and other auto model developments you mention, nor of Gabriel's news about the Eastern European interest in such things. Per your request, my next post will be a pair of Hobby Master VF-2 Buffs I have. Looking forward to your Buffalo project, as well as seeing your pair of VF-2 Buffalos.